Filter in Digital Photography are elements of an optical system, which mostly attached before the lens of the camera for various reasons like to create effect, to protect the optical system from UV rays etc. Usage of Filter in Digital Photography that means Digital SLRs (mainly) has some difference with older SLR camera Filters due to various factors. What is this Filter actually is ? Filter used in photography are for both as a correction measure as well as for creating so called filter effects. Filter can change saturation, contrast or can include elements such as stars and effects. Most filters reflect a portion of the incident light so that less light reaches the lens. This is usually indicated on the version of the filter. Also a filter actually works like a transparent cover for the lens. Basically a Filter is nothing but a simple circular plate usually with a screw mechanism to get attached in front of the lens. They optically usually has no power, but a separate kind of lens is used based on the principle of Filter. There are called closeup lenses. Unlike the old film photography, today we can actually create various effects in any Advanced Image Editor like Adobe Photoshop. That factor has reduced the craze of using filter to some extent, unlike they were used before. 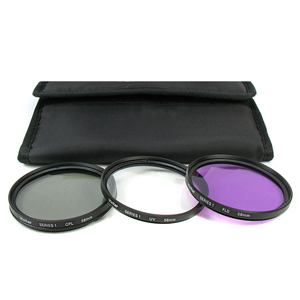 Filter are usually specific to brand of camera : Filter for a Nikon Lens, might not be mounted on a Canon Lens. Cost of filters depends on th manufacturer and quality. There are many well established brands that can cost a huge premium. Filters can be sold as a separate unit or as a set of various kind of effect creating filters. We will go in detail on each kind of Filter individually in future articles. This Article Has Been Shared 832 Times! Guide to Use a DSLR Camera describes how a DSLR camera works and how you can exploit the features to 100% after knowing the basic principles of operation. How to Create Perfect Bokeh With Your DSLR and Prime Lens is a question of many users. Let us see how to create great round bokeh and custom shaped bokeh. Autofocus uses focus algorithms interpret the shooting scene and evaluate different aspects to determine which point should be in focus and thus can be handy. Tripod often brings the first impression on the This thing I will ever need. But you will discover how this soon how this three legged thing is useful. Cite this article as: Abhishek Ghosh, "Filter in Digital Photography," in The Customize Windows, July 10, 2012, April 25, 2019, https://thecustomizewindows.com/2012/07/filter-in-digital-photography/.